Posted	 July 21, 2016 by	Sikh Dharma International & filed under 03-Guru Amar Das, Sikh History. A trader by name of Goinda once hoped to establish a post at a ferry landing to take advantage of the traffic at the crossroads. He encountered a great many difficulties in launching this venture and asked Guru Angad Dev Ji’s blessing on it. Guru Angad asked his faithful follower, Amar Das, to oversee the project. Later, Amar Das helped to lay the foundation of a village became which came to be known as Goindwal after the trader, Goinda. When Amar Das became the third guru, he moved permanently to Goindwal where he and Guru Angad’s widow, Mata Khivi, worked together to carry on the tradition of langar (free meals served from the Guru’s communal kitchen). Guru Amar Das decreed that all who came to see him should be first fed and implemented the concept of “pangat sangat,” nourishment of both body and soul, insisting all people sit together as equal without regard to gender, faith or caste. Guru Amar Das arranged for a baoli, or covered well, to be constructed in Goindwal in order to serve the needs of the community. This ancient well has become a popular historic Sikh shrine and currently spans about 25 feet, or 8 meters. An arched access opens to a domed entrance decorated with frescoes depicting the life of Guru Amar Das. A divided underground staircase with 84 covered steps descends beneath the earth to the well’s sacred waters. One side of the staircase is for the use of women and the other side is for men. Each step is thought to represent 100,000 life forms of a possible 8.4 million existences. 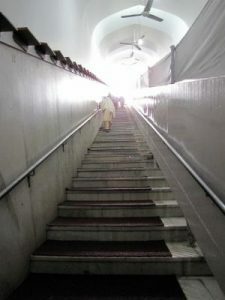 Many devotees visiting Goindwal Baoli Sahib recite the entire hymn of “Japji” on each step. The devotees first descend to bathe and perform ablution in the waters of the well. Next devotees begin to recite Japji on the lowest step. After completing the prayer devotees return to the water of the well for another dip. Devotees then move on to the next higher step, repeating the prayer and reciting in all, 84 complete recitations of Japji Sahib in the hope of being liberated. During his lifetime Guru Amar Das penned 7,500 lines of inspirational poetic verse, including Anand Sahib, which later became part of the scripture in the Siri Guru Granth Sahib. The Guru uplifted the status of women and encouraged them to discard the veil. He supported remarriage and denounced the practice of sati, a Hindu custom compelling a widow to be burnt alive on her husband’s funeral pyre.